Imagine tearing up the ski slopes, navigating an extreme mountain bike trail, or kayaking through heart-thumping rapids. Now imagine capturing the action on video. 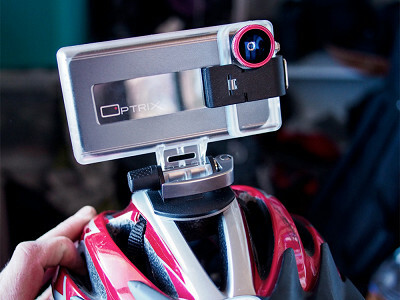 With an Optrix lens and protective case, you can transform your iPhone into a rugged action sports camera. On its own, the iPhone delivers impressive HD video. By adding a wide-angle Optrix lens, your footage can look like a pro shot it. Both the XD4 (for iPhone 4s, 4, iPod Touch) and XD5 (for iPhone 5) lenses feature military-grade construction, including a rugged polycarbonate shell and rubberized inner iPhone case that are designed to withstand bumping, crashing and even splashing (the XD4 and XD5 are waterproof to limited depths). 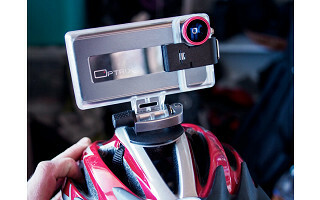 Both come with mounting accessories so you can secure your iPhone to a helmet or handlebar, for example. The XD5 also adds a charging door that lets you charge the iPhone 5, plug in headphones, and take calls without removing the case. John Willenborg created Optrix to make it easy for people to capture action sports without lugging a dedicated camera. Combined with the iPhone’s existing video capabilities, Optrix lets you relive (and share) exciting adventures in skiing, biking, skating, racing and more. Ready, set, action! Hi Daily Grommet! I'm proud to share our sports phone case with you today and happy to answer any questions. What's your favorite sport to video? I bought my son thle Canon waterproof camera. Could that fit inside the case. He doesn't own an I-phone. Unfortunately, no. Our cases were designed to snuggly fit the iPhone and match it's camera lens placement. Our cases will also fit the two latest generations of iPod touches. The XD4 would require an accessory iPod sled to accomplish this. What kind of mount does the XD5 have? Are there any types of surfaces it will not attach to securely? The XD5 will come with a flat base and a curved base mount (for helmets) in the box. Both of the mounts have 3M industrial adhesive strips and will stick to just about any surface that is out there. One thing to note, is that the adhesives need to be placed on a clean surface at room temperature, as the adhesive will not adhere securely in cold temperatures. Along with our chest mount, we will also have accessories available to make the mounting solution near limitless via our tripod (1/4" 20 screw) adapter. Imagine tearing up the ski slopes, navigating an extreme mountain bike trail, or kayaking through heart-thumping rapids. Now imagine capturing the action on video. With an Optrix lens and protective case, you can transform your iPhone into a rugged action sports camera. On its own, the iPhone delivers impressive HD video. By adding a wide-angle Optrix lens, your footage can look like a pro shot it. Both the XD4 (for iPhone 4s, 4, iPod Touch) and XD5 (for iPhone 5) lenses feature military-grade construction, including a rugged polycarbonate shell and rubberized inner iPhone case that are designed to withstand bumping, crashing and even splashing (the XD4 and XD5 are waterproof to limited depths). Both come with mounting accessories so you can secure your iPhone to a helmet or handlebar, for example. The XD5 also adds a charging door that lets you charge the iPhone 5, plug in headphones, and take calls without removing the case.